Recently I had the chance to discuss the fascinating article, “The Sick Man of Asia” with the doctors at my hospital. The author, Huang Yanzhong, argues that despite China’s seemingly impressive gains in health over the past 60 years, they are lagging behind its economic growth. Furthermore, the author seems to argue that the average Chinese person (as far as health is concerned) saw greater benefits from Mao’s time in power than during Deng, Jiang, and Hu. 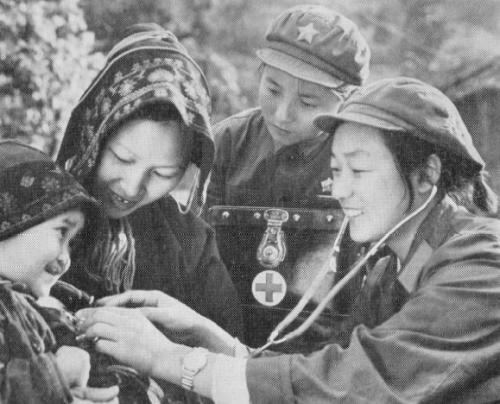 The author argues that Mao’s regime was able to make large gains because they focused on bringing medicine to rural populations. Huang also shows that the chaos of the Cultural Revolution caused the bureaucratic powers of the Ministry of Health to retreat, while millions of doctors were sent to the countryside. Opening up and reform in the 80’s though focused resources into a few urban hospitals, which by 2004 were receiving 80% of all gov’t health spending. This problem was compounded by the new choices brought to rural residents with opening up, and people from the countryside bypassed the local clinics in favor of the bigger and better equipped urban hospitals. While I would not want to deny villagers the option of coming to the cities for treatment, it has exacerbated the issue and removes some of the pressure to reform smaller clinics. Additionally, funding from the central gov’t for health was reduced during this time, making hospitals increasingly dependent on prescriptions, surgeries, and additional testing for income. This caused a rapid increase in the cost of treatment, and as a study from 2004 showed, nearly 41% of farmers living below the poverty line reported falling ill or being injured as a cause of their poverty. Even more troubling is the fact that 60-80% of farmers died at home because they could not afford hospital costs. The author cites the fact that surgery for stomach cancer costs nearly 12,000 RMB, which is far more than an average farmer makes. A friend told me that farmers use the expression “得了阑尾炎，白种一年田” (appendicitis costs a year in the field) to complain about the high cost of medicine. While China has continued to increase medical spending, especially after the outbreak of SARS, there is still a strong urban bias. In the two groups I discussed this article with, virtually none of the sixty doctors agreed with the author that healthcare had not improved much (which wouldn’t have surprised Huang; they work in a well funded urban hospital), but when asked if healthcare was unequal, they agreed unanimously. When asked “Who benefits from China’s health care spending?” The first answer was gov’t officials, followed by the rich, and finally people in cities. Nothing shows this more clearly than the fact that Shanghai’s life expectancy is now over 82.5 years, while the average for the rest of China is only 73 years. Instead of focusing on improving healthcare across all segments of the population, the Party’s policies (and in some cases inaction) have reduced the possible gains that could have been made. The priority given to the urban population after reform and opening up is something we’ve discussed before in relation to Hukou issues, and the state of rural education. China’s obsession with creating institutions for the elite, means that the masses are excluded from fully participating in the benefits of China’s growth. I think that many would agree that it was the push by the Party in the early days of Mao’s leadership for literacy and expanded access to education (for women and the poor) that have allowed China to become such a powerhouse in low-end manufacturing. The Party has also stated that for the economy to continue to grow, the country needs to move towards more skilled manufacturing, but they didn’t start taking steps to promote vocational education until a few years ago. Instead, for years the focus had been on creating “world class” universities and pushing more students through graduate programs. A Chinese friend told me that he had always opposed this because there were so few jobs requiring such degrees, other masters students I have met have agreed. The gov’t has also allowed the collapse of social security programs which in the past would have encouraged families to keep their children in school; some of China’s poorest counties have dropout rates of over 50%. These children are pulled out of school to try to support their family, frequently when a working family member falls ill or dies. Meanwhile urban children who fall behind their classmates are pushed out of schools by teachers who fear losing the bonuses that come with good exam scores. With increasingly out of reach premiums for decent healthcare and schools that focus only on the most talented students in urban areas, it’s easy to see why some argue that China’s growth is unsustainable.These gaps in basic services between rural and urban citizens are a major cause of the gap between rich and poor; which consequently, drives a wedge between the people and the Party. The key then to stability is aiming lower, not higher. By T in Economy & Development, Education on March 21, 2012 . For another article on this topic, go to the YaleGlobal website and check out Children of China’s Future Part II by Karen Eggleston, et al.